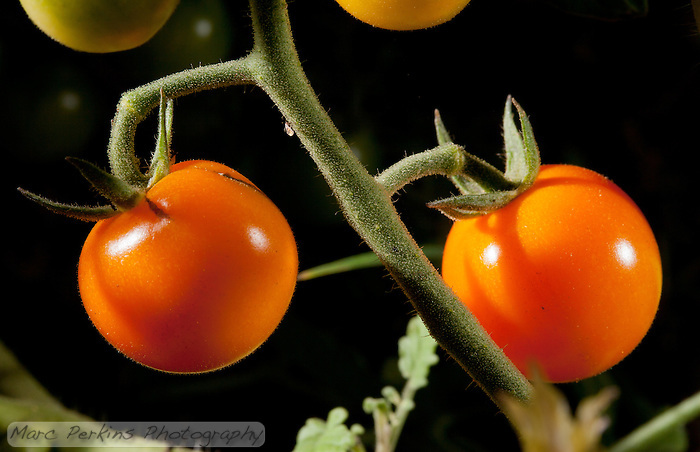 Two ripe Sun Sugar cherry tomatoes still attached to the plant, photographed using natural light only. 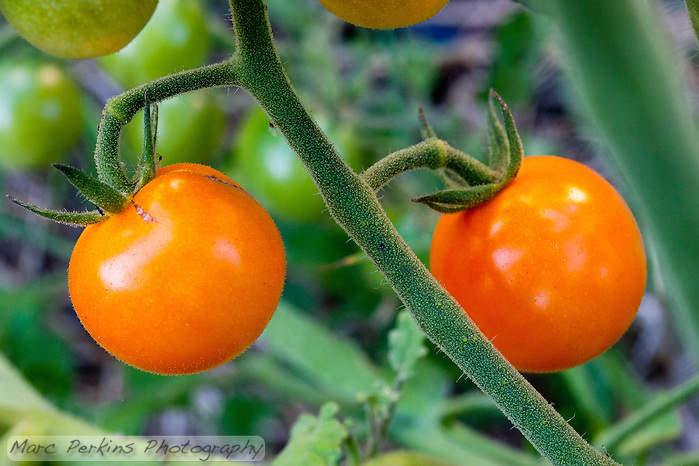 The tomatoes were in some nice diffusely-lit shade, and that’s what you see above – I used a tripod to stabilize the camera, but otherwise didn’t need anything else. But since I’ve been having fun experimenting with off camera lighting recently, I decided to pull out my lighting gear and try some “studio” style lighting on the fruits. The same two ripe Sun Sugar cherry tomatoes, photographed using “studio” lighting. Those are the exact same fruits in the exact same position, but now they’ve been lit using the “invisible black background” technique I’ve described before1. What a difference lighting makes! The black background makes the fruits pop out visually, thanks to less visual clutter, but I think it also makes the scene look more artificial (or as though it was taken at night). My favorite comment so far comes from my dad, who said that the fruit look like two “hot Jupiters”. Little tomato planets floating in space; I like it. 1 Two snooted flashes were setup, one on either side of the fruit, and I used my gray card to shade the background from the primary flash’s illumination. Both flashes also had great natural gobos: the branches of the plant itself. To see more of my plant-related pictures, head to my Botany and Mycology gallery collection. 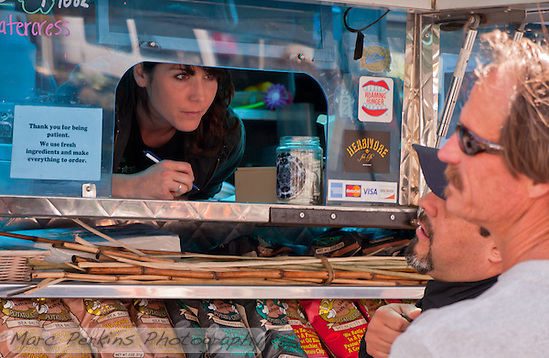 Chef Stephanie Morgan of Seabirds takes an order. 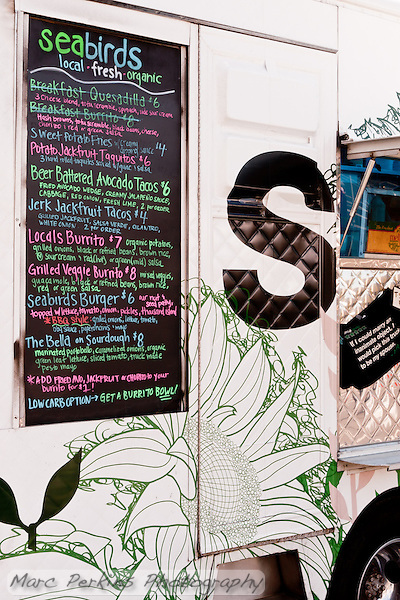 Gourmet food trucks are all the rage right now in Southern California. Luckily for me, there’s a gathering of them every Thursday from 11-2pm at the Orange County Fairgrounds, which is just a short walk from my office at OCC. And there are other meetups nearby as well: SoCo Collection has food trucks Tuesdays, Thursdays, and Saturday at lunch and Fridays for dinner. A colorful menu for colorful food that's different from your typical food truck sliders and quesadillas. I got there too late to enjoy their breakfast fare (that whole waking up early thing is hard). Many trucks focus on meat, meat, and more meat, possibly with fries on the side. While this is delicious and all, there’s a decided lack of non-potato vegetables and non-meaty entrees. Don’t get me wrong; Louks has their delicious felafel gyro, Chomp Chomp has a great tofu burger, Flying Pig has their crunchy tofu bun, Crepes Bonaparte has a variety of non-meat fillings, Spud Runners has excellent grilled cheese sandwiches, and Chunk ‘n Chip’s ice cream sandwiches are to die for, but my favorite truck has to be Seabirds. 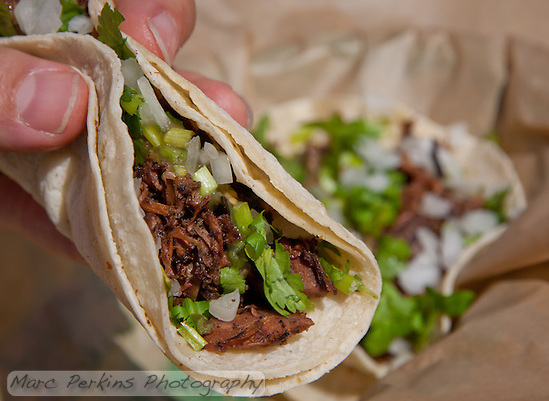 At Seabirds, their specialty is fresh and flavorful vegan burritos, tacos, burgers, soups and more. But don’t let the vegan designation scare you away: their food is delicious. You know you want to try some of Seabirds's Jerk Jackfruit Tacos 🙂 They take jackfruit, process it so that it's somewhat meat-like in texture, and then coat it in Jamaican Jerk spices; it's delicious topped with salsa in a fresh corn tortilla. Takoyaki are a delicious treat: they’re a ball of savory fried dough with a custardy interior filled with bits of onions, peppers, and a chunk of meaty octopus. They’re often served covered in a slightly sweet sauce and topped with shaved bonito (dried fish). I was introduced to Takoyaki by watching them being made on Dotch, a Japanese cooking show. I’ve since gotten to eat them at a couple of local Japanese restaurants (most notably Kohryu, my favorite ramen place), but had never seen them made in person.